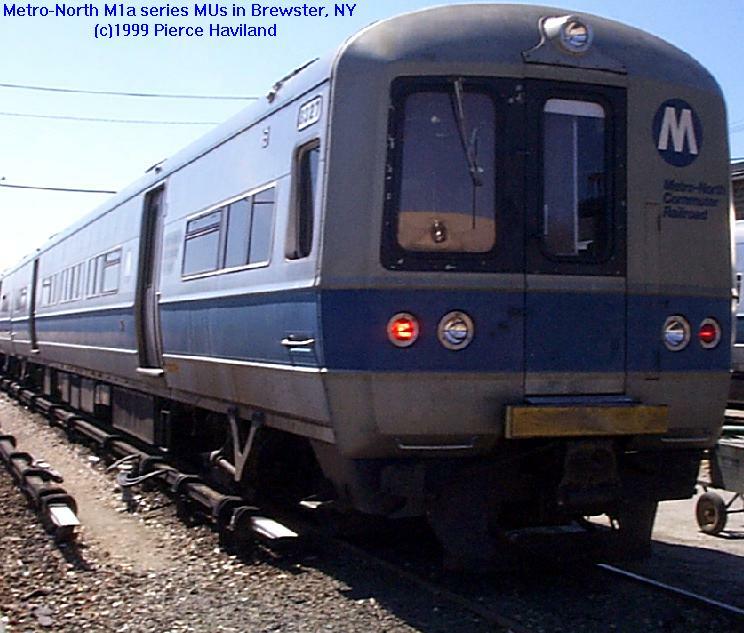 IN ITS 25-PLUS YEAR HISTORY, Metro-North has operated an assortment of equipment, from traditional Budd stainless-steel cars to the latest electric M.U. cars built in Japan. 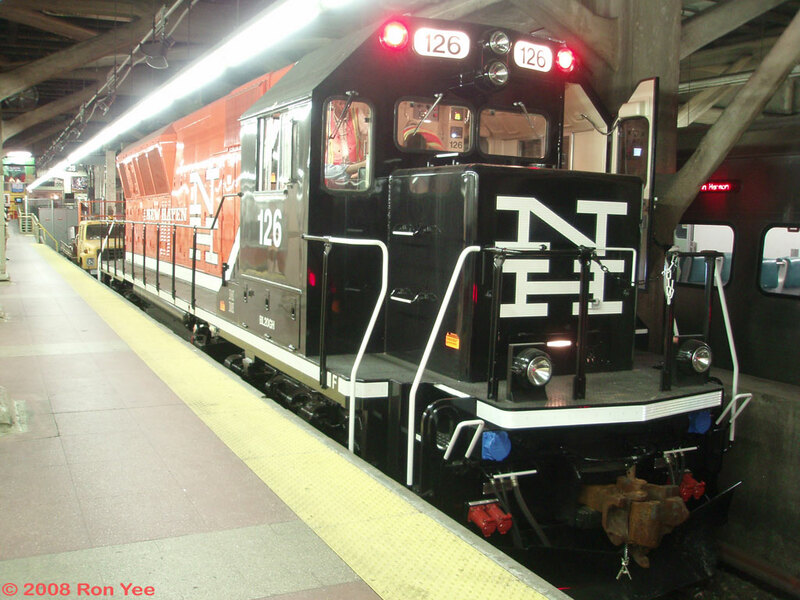 Metro-North continues to roster "historic" equipment, such at the former New Haven FL9's. and the former Illinois Central Gulf F-10s. As MN moves towards a more efficient operation, much of the variety has been leaving the rails. Get your shots soon! The RDC was seen by railroads as the cure-all for branch line passenger trains that were losing money. The New York Central purchased a fleet of 19 RDC's, which they called "Bee-Liners" (oddly enough, Westchester County has named their fleet of buses the same). The New Haven also had a substancial fleet of RDC's. These cars more or less retained the same numbers as they passed hands from Penn Central to Conrail, to Amtrak and Metro-North. 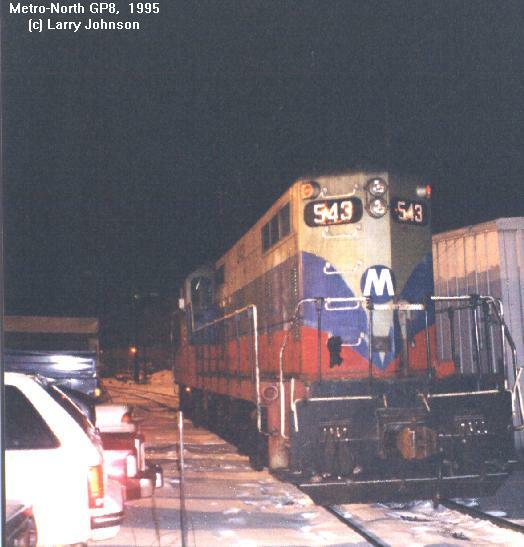 The last RDC ran on the Waterbury Branch in 1990, and on the Port Jervis Line in 1991. These cars now survive at the Danbury Railway Museum and in Susquehanna's new Syracuse commuter service. Trying to bank on the success of the RDC from thirty years earlier, Budd's Red Lion plant began to chrun out the SPV as successor. Peddled mostly to commuter agencies, it relied on an Amfleet-style body propelled by an inferior diesel engine. Hence, most shop crews called them "Seldom-Powered Vehicles." Conrail/MTA purchased a few of these beasts in 1981, as did the State of Connecticut. Amtrak also purchased a few for its Connecticut services. 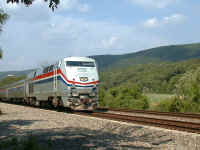 The SPV's saw service on the Waterbury Branch, as well as the "Dover Plains Shuttle" between Brewster and Dover Plains. I can recall them being used in diesel territory as late-night shuttes through Cold Spring on the Hudson Line as late as 1991. Currently, these cars are residing on the Croton dead line awaiting their fate. They will most likely be sold off as de-motorized coaches. 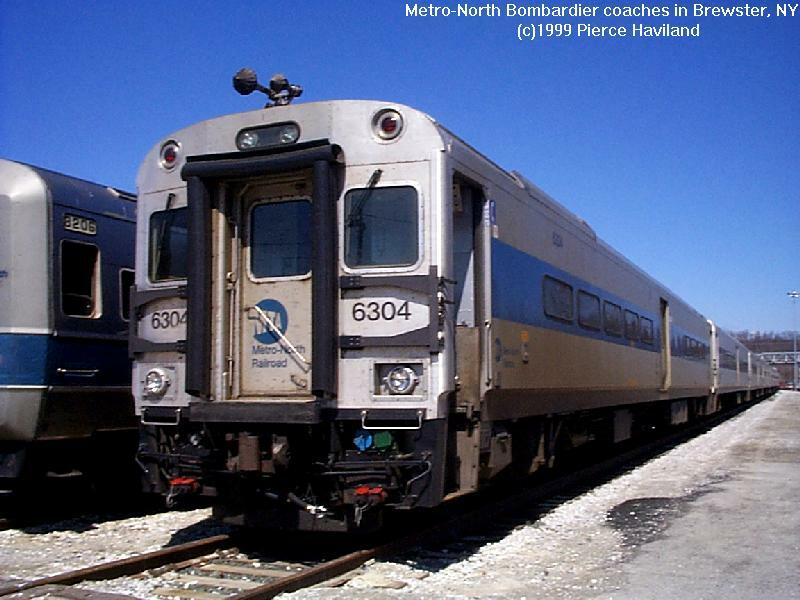 Metro-North picked up several B23-7's from Conrail in 1983 for use in work train service. Inevitably, these units saw service as passenger units in the early "keep-it-moving" days of 1983. Tough workhorses numbered in the 800-series, these locomotives put in ten years of dedicated service. 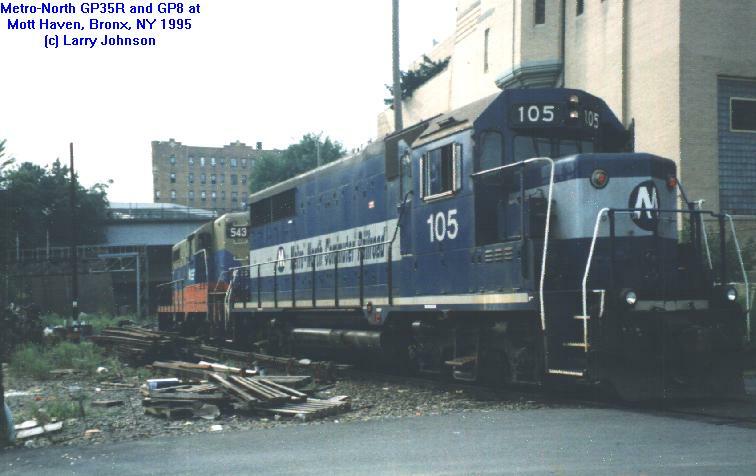 In 1993, they were cycled back to Conrail in trade for some former PRR GP35's. The E10-B was built by General Electric in 1950 for use on the Niagara Junction Railroad, in Niagara Falls, NY. 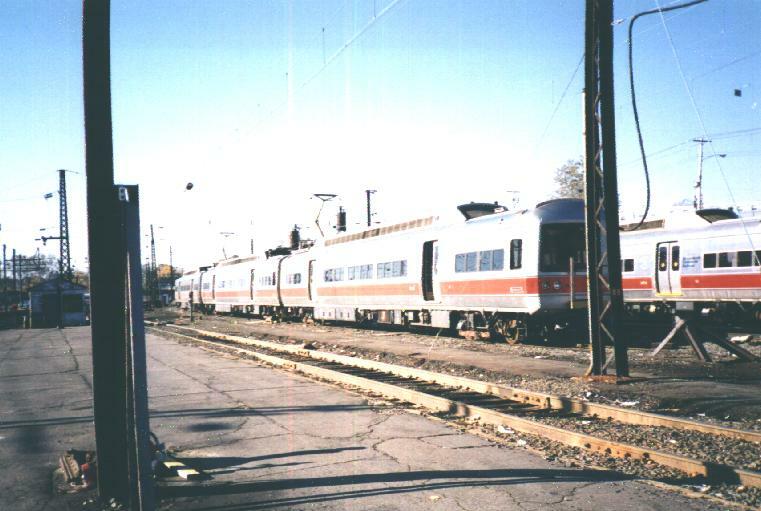 The NJ was electrified, and the E-10's collected power from a rooftop pantograph. They resemble 44-tom switchers is size and shape, but look more like classic traction motors upon closer inspection. When Conrail was formed in 1976, they assumed control of the NJ. Conrail dieselized the line in 1980, making the E-10's surplus. About this time, the last former 1910 vintage NYC S-motor was working as the Grand Central switcher, and was in need of replacement. The E-10's were used as Terminal switchers until about 1991, when Amtrak vacated for Penn Station. The E-10's have been retired from service. 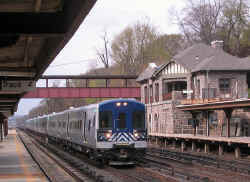 When Metro-North expanded service on the Danbury branch to include more direct service to Grand Central in 1991, they found themselves short of equipment. At this time, Detroit's commuter carrier SEMTA (operating the last remnant of the former Grand Trunk Western service) called it quits. Up for grabs were various rebuilt former Pennsy, GTW, and Union Pacific coaches in reasonable condition. These cars ran in SEMTA colors for awhile, and were kept in traInsets. Soon, the cars received paint similar to that of the ACMU 1100's- gray with a wide blue stripe below the windows. 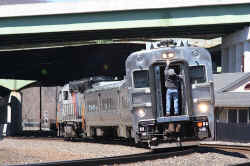 They were numbered in the 4800 series and operated for about two years until more conventional equipment could be found. The coaches sat on the dead line in Croton for a year until they were sold off or scrapped. As the MTA sought to improve the Penn Central-operated commuter services, their first priority was to find improved equipment. Through the 1970's, major railroads were cutting back on their long-distance passenger trains. This created a surplus of then twenty-year-old stainless steel coaches and club cars. The MTA purchased surplus cars and painted them with blue window bands. In turn, the FL9's received an interesting yellow-nose, blue-body scheme. This was to simulate to the commuters the idea of "brand-new" equipment. In time, the lexan windows turned opaque in a sort of milky green color. The upholstery was in poor condition, and many of the car's bathrooms emptied right to the tracks. The only reprieve in those days were the Bar Cars. These were an oasis of luxury of a time past in a desert of decay. I remember riding an early Conrail/MTA train on the Harlem Line as a toddler with a consist of such equipment. Needless to say, today's improvements are light years ahead in terms of reliability and cleanliness. All cars were disposed of or sold off through the 1980's as new equipment came on line. 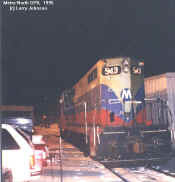 Some cars of note survived as the official Metro-North business train. The observation car from the Lackawanna's Phoebe Snow has survived (as MN-3), as have a couple of former NYC club cars (MN-1, and -2). 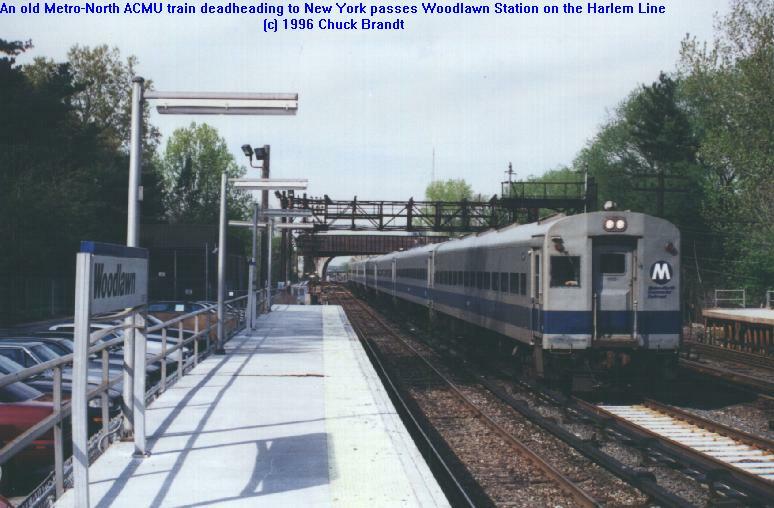 The last original New York Central equipment used in daily service, the ACMU's (Air-Conditioned Multiple Unit) were built for the Central in 1956. Similar in design to an order built for the Long Island Rail Road by Pullman-Standard. Numbered in the 1100 series, they are true MU cars, as they could be operated in single units, from either end. As they began their fourth decade of service, word came down that the fleet would be retired. Commuters rated these rebuilt cars very highly, due to their roomy accommodations, wide picture windows, and bright lighting. Railfans will note the flop-over reversible seats upholstered in a rattan-textured material. 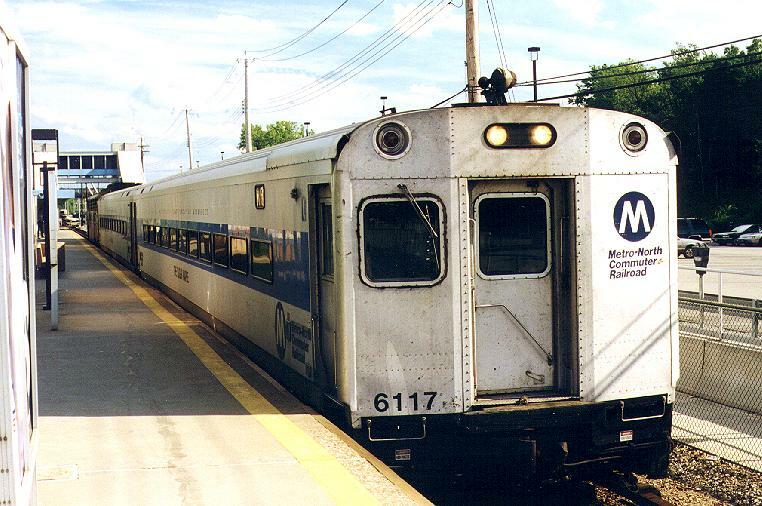 The ACMUs were retired in 2004 as the M-7s were put in service. Built 1956-1960 for the New Haven Railroad. Last production "covered wagon" cab diesels produced by General Motors EMD. Rated at 1,800 h.p., they can operate off of 600v third-rail, or off its own diesel generator. Early models had a small rooftop pantograph to gather current from roof-mounted third rails over switch gaps in the depths of GCT. The New York Central did test the FL9 on some Harlem commuter trains in 1956, but did not buy into the concept (though they liked the idea of eliminating the engine change at North White Plains and Harmon). Six units were rostered to Amtrak (in their 400 series, only two remain in standby service), four rebuilt AC units worked on the LIRR before being sold to Metro-North. The rest toiled for MN and CDOT, before being retired. 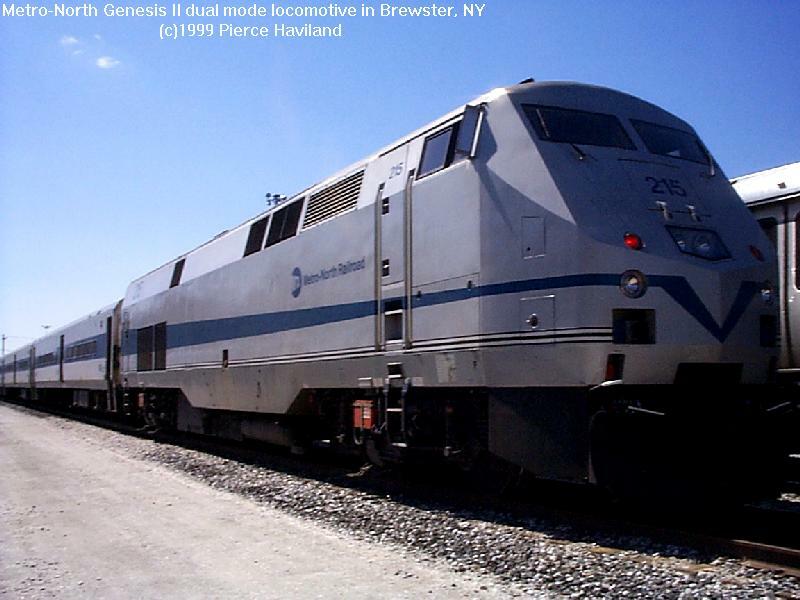 In 2001, Metro-North received a final delivery of 14 additional Genesis engines that replaced all FL9s on long-haul trains. Four of the new Genesis units are in New Haven colors. 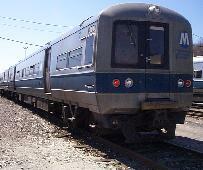 In 2006, Metro-North still had three F-10 units in service. The 413 was built by EMD in 1946 as an F3 for Illinois Central Gulf. It was rebuilt at the Peducca Shops in the 1970s and had a head end power unit installed to replace the steam generator. This required some body modification at the rear of the unit that is plain to see. 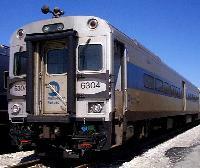 ICG later sold the units to MBTA, which later sold them to Metro-North. The F-10s have provided 60 years of reliability in high-speed passenger service. Because they lack dynamic braking, the F-10s are restricted to 79 mph. and work exclusively on branch line shuttles and work trains. In the late 1960's, the NJDOT was looking to improve the quality of service on the commuter services operated by the Erie Lackawanna out of Hoboken, New Jersey. The state ordered a new fleet of Comet coaches from Pullman-Standard. Most of these cars survived to be handed over to NJ Transit Rail in 1983. 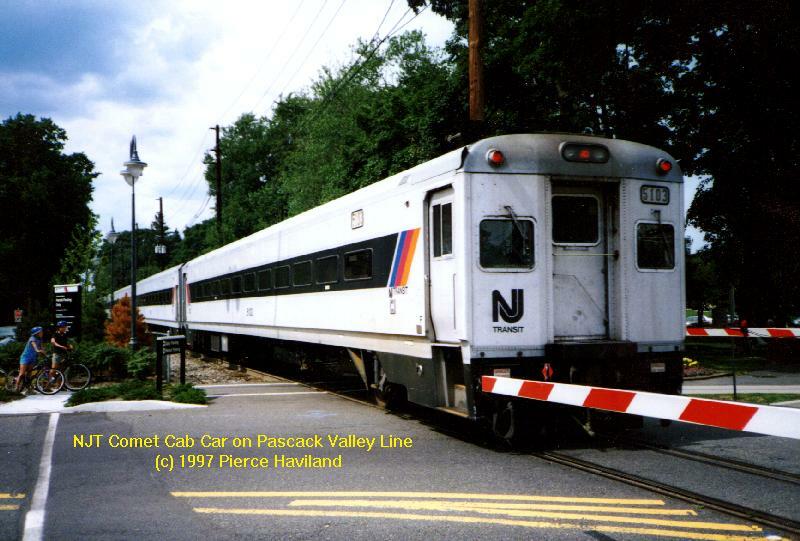 When the MTA contracted with NJT to operate the Port Jervis and Pascack Valley lines, some cars received MTA/Metro-North markings. These cars have a purple stripe, similar to the NJT cars. Some cars carry the older two-tone "M" logo. On some cars, the EL/NJDOT markings can be seen underneath. 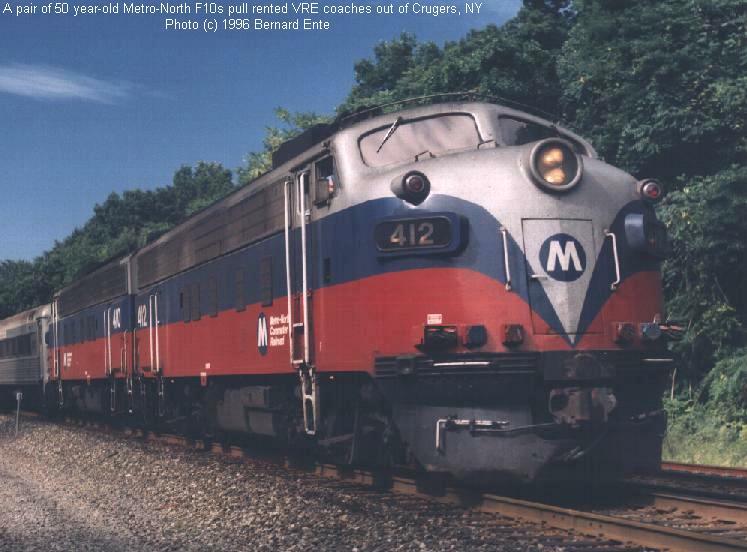 The Comet V coaches were the first passenger cars designed to be totally controlled with an IEE 1473 network trainline, although Metro-North M-7 cars use a similar control. In 1999, New Jerset Transit awarded a 232 million dollar contract to Alstom to build 230 push-pull cars. 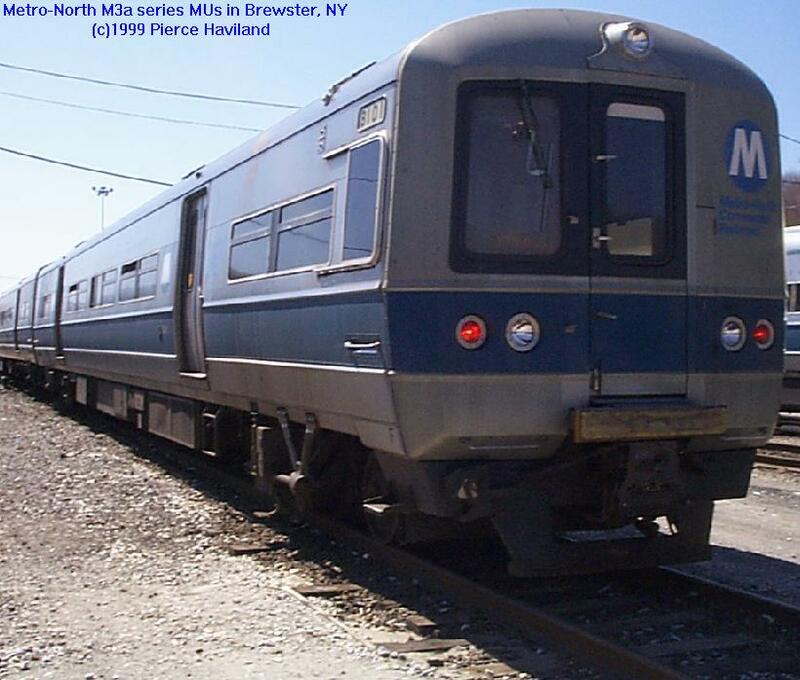 Metro-North exercised an option to buy 30 of these cars. The cars are being used to replace the Comet I series, seen above. Bombardier purchased the old Pullman-Standard design used on coaches built for Erie Lackawanna's commuter services in the late 1960s. The cars were designated "Shoreliners" by Metro-North, since they would be serving on the Hudson and New Haven Lines (both bordering bodies of water). 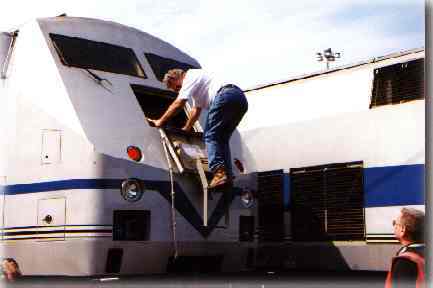 A car of similar design would find its way to NJ Transit, MBTA, SEPTA, and in 1990, Amtrak. MN's cars are unique, as the cab-end only has one window for the engineer. With center-door ADA access. A window was added for an observer on the cab cars and the door was removed next to the engineer's control stand. 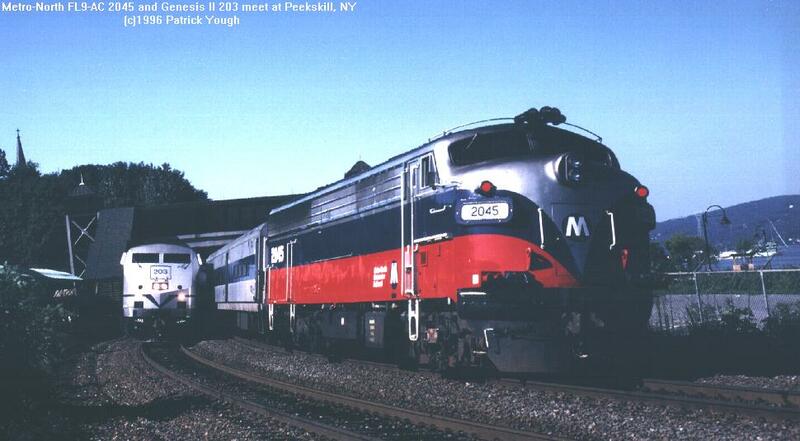 Metro-North bought several GP35R's from Conrail in 1993 in trade for the B23-7's currently in use. These GP35's were rebuilt from former Pennsylvania Railroad engines at Conrail's shop in Altoona (hence the R-designation). These locomotives carry a paint scheme devised by the late Roch Gladulich, and are numbered in the 100 series. These engines roam the system performing various tasks from hauling the rail train to shuttling dead-head moves to Grand Central. 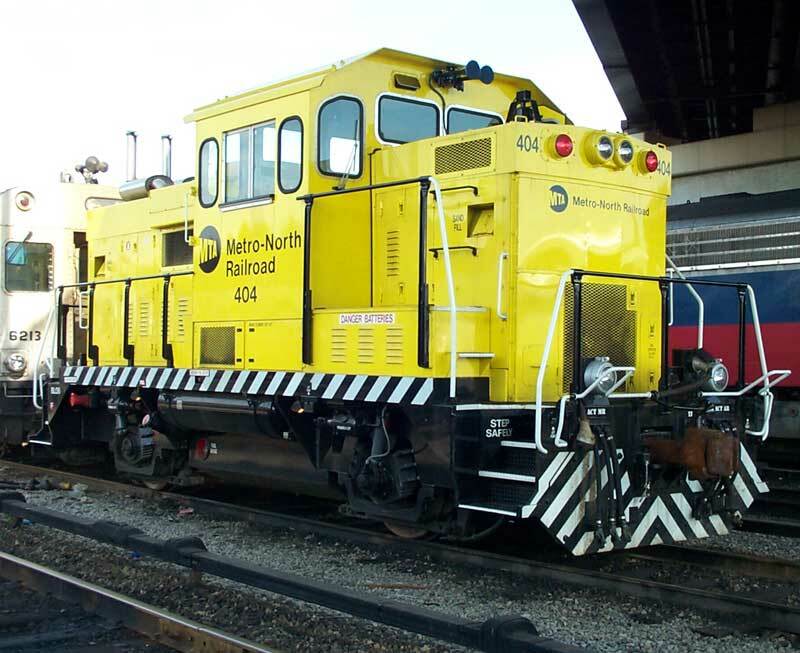 Metro-North engine 750, a GP9, is one of the last engines in the Northeast US with an operating steam generator. M-N uses the steam to clear the third rail of ice and snow, not to heat coaches. Engine 605 is Metro-North's only diesel that is not equipped with cab signals (a borrowed NYCTA switch engine also lacked this feature while operating in Grand Central Terminal). This Alco was modified years ago with a 1,200 hp EMD prime mover. It has been a regular workhorse at the Harmon shop. The GP40PH-2 is used on West of Hudson Service. Height restrictions prevent Metro-North from using similar engines on east of Hudson service. The FL9AC (the AC stands for AC traction motors) was a total modernization of the old FL9. 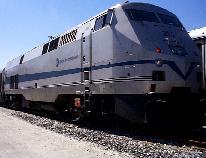 The 1,800 hp engine was replaced with a 3,000 hp turbo charged EMD diesel. A computer controlled traction and regenerative dynamic braking. The FL9ACs could operate at maximum speed in either diesel or electric mode, but the electric operation was plagued with problems. While engineers liked the fast acceleration out of a station, the units broke down frequently and were maintenance nightmares. These units have been cut up for scrap. Metro-North units differ from the Amtrak units primarily in third rail operation. M-N units are equipped for extended range in DC mode and do not have retractable third rail shoes, and they have an emergency escape door on the nose. The two Brookville engines roam the Harmon and Brewster shop areas making yard switching moves. They have only four wheels (two axels) and 600 horsepower, but can pull a lot for a small engine. These engines were originally built for use in Grand Central Terminal but could not shunt the signals properly with only two axles. They are equipped with cab signals and can be used on the road when towing additional cars. The BL20-GH is a combination road switcher and passenger engine equipped with an MTU 12V4000R33 2,250 hp prime mover and head end power unit. The engines were ordered by CDOT and Metro-North to replace the aging FL-9s and rented Amtrak Genesis engines on branch line shuttle trains.